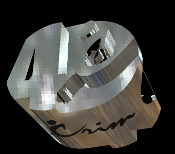 What better way to show off your acheivment by adding a 40th anniversary Crim bead to your bracelet. This bead is cast out of the finest sterling silver and captures the essence of the Crim with the iconic logo and the years the race has been held. This bead will become a classic to commemorate the finest 10 mile race in the nation.